Last Saturday saw a performance that, in the second half especially was at a standard that gave the match a feel of an exhibition game such was the level of control of possession. Swansea made more passes in the second half than Fulham made in the whole game, as can be seen from the comparison below of Fulham’s passing overall with Swansea’s in the second half. Fulham whole game compared to Swansea Second Half: Fulham actually made more passes in the attacking third during the match than Swansea, but Swansea's patient play meant that when the ball did eventually go forward it was often to Allen/Sigurdsson in large amounts of space. Special mention must go to Leon Britton, Leon played 100 passes in total with a 96% success rate, the highest number of passes and the highest success rate of any player in the match. In terms of the technical aspect of what he does there’s nothing flashy about it, but the constant movement and ability to anticipate where the ball is going to be and where he needs to be a couple of passes down the road to support his team mates is impressive to watch. 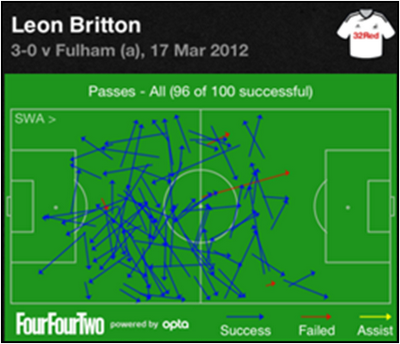 Only 4 misplaced passes all game and his stats for the second half were 61 successful from 62 passes. 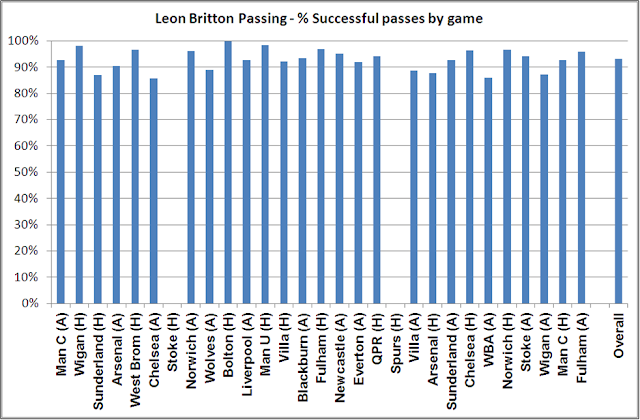 For the season as a whole, Leon is averaging a Pass Success rate of 93.2% which is the highest for any player in any of the 5 major European leagues. In the Premier League only 12 players have a Pass Success rate of 90%+, with Leon top and Joe Allen in ninth. Despite this being a blog heavily influenced by stats, I am fully aware the figures taken out of context can be misleading. A perfect example of that are Danny Graham’s figures: 21 touches, 13 passes and 1 shot (which was after a minute) suggest someone who had little input to the game. In reality Graham was instrumental to the aggressive pressing game played by Swansea which when coupled with the patient possession game can mean the opposition see little of the ball for long periods of time. Credit must also go to Wayne Routledge who impressed in this game as he did against Man City. He is less direct than Dyer (Routledge only attempted one take-on all game) but fits in well and his cross was instrumental for the first goal and his cut back to Sigurdsson set up the second. At the Swans Trust Forum on the eve of the game, Brendan Rodgers was asked about whether they'd be able to keep players at the club next season. He said that anyone leaving may get more money elsewhere, they may challenge for more trophies but he doubted they'd enjoy their football as much anywhere else. If the players (and Rodgers himself) heed this advice then this almost unbelievable progression might have even further steps forward. A full presentation of season so far stats (prior to Fulham game) is available here. This contains comparisons on shots, possession etc. with other Premier League teams as well as player by player stats for the Swansea squad.